With less than two weeks left in the regular season, things may finally be falling into place for the New York Yankees. On Tuesday, outfielder Aaron Judge made his long-awaited return from the DL. On Wednesday, closer Aroldis Chapman did the same. Chapman has been activated from the DL after missing nearly a month of action due to knee tendinitis. The Yankees can only hope that getting healthy will help them get hot heading into October. Chapman has battled knee issues for most of the season. However, things got bad enough last month for him to go on the DL. While he was out, Chapman received two injections of platelet-rich plasma. 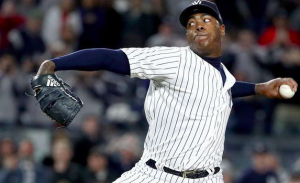 Coupled with nearly a month off, Chapman has declared himself good to go for the rest of the season. Before going on the DL, Chapman had saved 31 games in 33 opportunities. Opposing hitters were batting .136 against him, one of the lowest rates of his career. The hard-throwing lefty was also 3-0 with a 2.11 ERA over his 50 appearances. In short, he was once again one of the most dominant closers in the league. Perhaps more importantly, Chapman gave the Yankees stability in the back end of their bullpen. The Yankees struggled to organize their bullpen while Chapman was on the DL. Dellin Betances, Zach Britton, and David Robertson were all given opportunities to close out games. However, none were able to match Chapman’s consistency in the role. With Chapman poised to return to the closer’s role, New York’s other relievers may be able to settle into specific roles for the stretch run. With everyone healthy, the Yankees have arguably the best bullpen in baseball. With Chapman designated for the 9th inning, the trio of Betances, Britton, and Robertson are all available to provide the bridge from that day’s starter to Chapman. What matters now is getting Chapman back on the mound in game situations and making sure he’s ready for pressure-packed moments in October. The Yankees are almost officially eliminated from contention in the AL East, meaning they will have to reach the ALDS via the Wild Card Playoff. However, with their bullpen at full strength, the Yankees should feel better about their chances in that game. With Chapman back, the Yankees bullpen has the horses to hold onto almost any lead and do so over multiple innings. It’s a luxury the Yankees are hoping will help to carry them deep into the postseason.